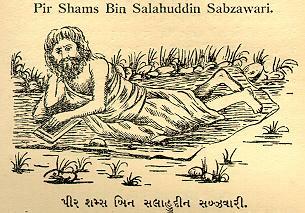 Abu'l Hasan bin Suleman bin Muhammad, known as Rashiduddin Sinan was born in 528/1133 at Aqr al-Sudan, a village in the district of Basra. He was handsome, of middle height, had dark eyes and was acute, learned, eloquent and quick-witted. He was brought up in Basra, where he became a schoolmaster and was converted to Ismailism. Subsequently, he went to Alamut where he was well received, and indoctrinated with Ismailism. He also studied theology, philosophy and the doctrines of philosophers and Ikhwan as-Safa. Soon after his ascension in 557/1162, Imam Hasan II had sent him to Syria as a deputy of dai Abu Muhammad. A historian quoted by Kamaluddin (d. 660/1262) reports a contemporary's description of a visit to Sinan, and a conversation with him, in the course of which Sinan is quoted as giving this account of his journey to Syria: "He (Hasan II) delegated me to Syria....He had given me orders and provided me with letters. I arrived in Mosul and stayed at the mosque of the date-sellers. Thence I went to Raqqa. I had a letter to one of our comrade there, and when I delivered it to him, he furnished me with provisions and lent me a mount to carry me to Aleppo. There I met another to whom I gave a letter, and he lent me a mount and sent me on al-Kahf, where I was ordered to stay. I stayed there until Shaikh Abu Muhammad, who was in command, died in the mountains." Sinan therefore became the chief of the mission in Syria after the death of daiAbu Muhammad in 558/1163. Benjamin of Tudela, who travelled there in 558/1163, about the time Sinan arrived, reported that the Ismailis had been at war with the Franks. Sinan was not only an outstanding personality but also an efficient administrator. Once well established, his first task was to consolidate his realm. He made Masiyaf as his headquarters and rapidly swept off the internal dissensions of the community. It was within the Ismaili terriroty that Sinan did his great work. In order to meet the dangers from outside, Sinan began reorganising his men and choosing the most eligibles, and devoted to form the corps of the fidais. He had his fidais trained in various languages and in the art of collecting secret information from the courts of kings and princes. He organised an elaborate communication system, making use of carrier pigeons, or the pigeon post, and coded messages by which the commanders of the various Ismaili strongholds were kept informed about the news of brewing trouble, his plans or the possible threats to any of the widely scattered Ismaili fortresses. These messenger birds proved beneficial, which could fly unscathed back to their lofts from distant lands. How Sinan could resist successfully before internal intrigues and external menaces is a mystery to many writers, and the history, as distinct from fiction, proves otherwise. The outstanding secrecy of his success appears to lie in his extraordinary ability to foresee trouble and nip it in the bud. He has established a perfect espionage system which covered not only his territory but that of his enemies as well. According to "The Encyclopaedia of Islam" (Leiden, 1936, 3rd vol., p. 1123), "The stories connected with Sinan chiefly centre around his organisation of fidais, which he used as an instrument for removing his political opponents by assassination. Undoubtedly, there are some grain of truth in these stories; but it is obvious that excited bazar rumours greatly exaggerated them, wrongly attributing to him and his organisation many exploits for which they were not responsible." Sinan also renovated and repaired the fortress of Rusafa, 40 miles from Masiyaf; and the fortress of Khwabi, 4 miles from Kahf. He also occupied the fort of Alika, just 8 miles away from the Frankish fortress of Marakab. With the taking of these fortresses, the Ismailis in Syria had however carved out their own niche in the aggressive orbits. He certainly brought the Ismailis to the peak of their power and fame, and was in close contact with the ruling Imams of Alamut for necessary directions. In Syria, the Sunni rulers and the Crusaders were a constant threat to the Ismailis, and therefore, Sinan concentrated his due attention on the Sunni rulers, who were extending their hegemony over Syria. Nuruddin (541-569/1146-1174), the Zangid ruler of Aleppo, and Salauddin Yousuf bin Ayyub (d. 589/1193), known as Saladin in the occidental chronicles of the Crusades, who put an end of the Fatimid rule in 567/1171 and proclaimed Abbasid suzeranity in Egypt by establishing the Ayyubid dynasty; were at the height of their power. They led the holy war against the Crusaders, and were potentially greater enemies than the Franks for the Ismailis. Being a shrewd strategist and diplomatic minded, Rashiduddin Sinan followed suitable measures in dealing with the outside world in defending the Ismaili state in Syria. He established peaceful relations with the Crusaders, who had been fighting the Ismailis for several decades over the possession of certain strongholds. Most of the strongholds which the Ismailis seized at Jabal Bahra in Kahf had previously been in the hands of the Crusaders, and many important Frankish castles were situated very close to the Ismaili strongholds. In 537/1142, the chief of the Tripoli gave to the Hospitaller order the fortress, called Hisn al-Akrad, 25 miles south of Masiyaf, and a few years later there are reports of fighting between the Ismailis and the Franks over the fortress of Maynaqa. Realizing the danger of being nearly surrounded by both Muslim and Frankish hostile forces, Sinan attempted to reach a settlement with the Frankish Templar order, and agreed to pay them a yearly tribute. Sinan sent an embassy in 569/1173 to Amalric I (1163-1174), the king of Jerusalem, hoping to be absolved from paying the yearly tribute to the Templars. King Amalric agreed that the tribute to the Templars should be cancelled. The Templars however disapproved this negotiation, and when the Ismaili embassy started for the homeland journey, Sinan's emissaries were killed by a Templar knight, Walter of Mesnil. Amalric took punitive action against the Templar knight, but was died in 570/1174, and as a result, the negotiations between Sinan and the Franks of Jerusalem became fruitless. Nuruddin Zangi was also a great threat in Syria and was planning a major expedition against the Ismailis just before his death, when he exchanged unfriendly correspondence with Rashiduddin Sinan. Ibn Khallikan (3rd vol., pp. 340-1) quotes a letter of Sinan, which he copied from the works of Abdur Rahim bin Ali al-Baysani al-Qadi al-Fazil al-Misri (529-596/1135-1200), which is in reponse of the harsh and threatening letter of Nuruddin Zangi, it reads:- "We have examined your letter in sum and in detail, and have well appreciated the words and deeds with which it threatens us. Admire the fly buzzing at the ear of the elephant! and the gnat which is counted as an emblem (of littleness). Already, before you, other people have held a similar discourse, but we hurled destruction upon them, and they had none to assist them! Do you mean to oppose the truth and uphold falsehood? They who act perversely shall know the fate which awaits them! As for your words, that you will cut off my head and tear my fortresses from the firm mountains which sustain them, know that these are delusive thoughts, vain imaginations; for the substance is not destroyed by the disparition of its accidents, neither is the soul dissolved by the maladies of the body. How wide the difference between strong and weak, between noble and vile!.....In a common and current proverb it is said: `Is a goose to be threatened with (being cast into) the river?' Prepare therefore a tunic against misfortune and a cloak against affliction; for evils of your own doing shall prevail against you ; you shall feel convinced that they proceeded from yourself, and that you were like the animal which scraped with his hoof till it found its death, and like him who cut off his nose with his own hand...."
In the meantime, Nuruddin Zangi died in 569/1174, it gave an opportunity to Saladin to emerge as a champion of the Muslims to lead them in the holy war against the Crusaders. Saladin strove towards incorporating Arabia, Iraq and Syria into his nascent Ayyubid empire. With the height of his power, he was a most dangerous enemy of the Ismailis, rather more than the Franks. On that juncture, the Ismailis of Syria and the Zangids of Aleppo were induced to formulate a joint bloc against their mutual enemy Saladin, who had entered Damascus in 570/1174. He also marched northward, and after capturing Hims, he laid a siege to Aleppo. Meanwhile, Gumushtigin, the ruler of Aleppo and Rashiduddin Sinan mutually decided to kill Saladin in order to save their states from being destructed by the Ayyubid power. Thus, a fidai was dispatched, who penetrated Saladin's camp, but missed to kill him in 570/1175. Next year, when Saladin besieged Azaz, north of Aleppo, the fidai failed in his second attempt to kill him in 571/1176, but Saladin escaped with only slight injuries. Shortly after this event, Saladin in a vengeful move, invaded the Ismaili territory and besieged Masiyaf. Lane Poole writes in "Saladin" (Beirut, 1964, p. 149) that, "When Saladin laid siege to Masyaf, Sinan was absent, and the king's summons to surrender reached him at a village near Kadmus. He told the messenger that he must have a personal interview with Saladin; and then, since access to Masyaf was blocked by the leaguer, he retired with only two companions to the top of a neighbouring mountain, whence he looked down upon the siege and awaited the event." By the Majesty of the Kingdom! what you possess will escape you, in spite of all, but victory remains to us We acquaint you that we hold you, and that we reserve you till your reckoning be paid. Saladin gave a great and terrible cry and the guards and the officers rushed in the tent. He showed them the letter. According to Lane Poole, Saladin said, "Go to this man and ask him for a self-conduct, and pray him not to punish me for my past action" (Ibid. p. 150). The messenger went to seek Sinan on the mountain; but he made answer that there could be no warranty for the king's life so long as he continued the siege. Saladin therefore withdrew himself, in such haste that he even left his artillery behind him; and at the Bridge of Ibn Munkidh, he received the self-conduct." Thus, Saladin sought peace with Sinan and concluded a truce with him. The overt hostilities between Sinan and Saladin came to an end as a result. Henceforward, the Syrian Ismailis seem to have thrown their weight on the side of Saladin in his wars against the Franks in the historic battle of Hittin, near Tiberias in 583/1187. The reason for this was that the rigorous attitude of the Frankish terrorists orders, namely Templars and Hospitallers towards the Ismailis, left Sinan with no alternative other than to ally himself with Saladin. It is therefore, asserted that the Ismailis had played prominent role during the third Crusade (1189-1192), and became to be discussed in the occidental chronicles. In 570/1175, according to Ibn Jawzi, the Ismailis had been menaced by the Nubuwiyya, a terrorist band of the Sunni based in Iraq, and their ten thousand horsemen attacked on Bab and Buza'ah. They slaughtered 13000 local people, including a heavy toll of the Ismaili lives and carried off much booty and captives. The Nubuwiyya order once again attacked in 572/1176, forcing the Ismailis to evacuate the region. The Spanish traveller Ibn Jubayr, who passed through Bab in 580/1184, relates the above event occurred about eight years before his arrival, in a harsh and derogatory manners, vide "The Travels of Ibn Jubayr" tr. by R.J.C. Broadhurst, London, 1952, pp. 259-60.